San Francisco's Colin Kaepernick was fourth among quarterbacks this season in rushing with 524 yards, though his passing stats were largely pedestrian. Packers defensive coordinator Dom Capers has had no answer for Kaepernick in their two meetings against each other. First, in last year’s playoffs, Green Bay’s defense seemed completely unprepared for Kaepernick and the zone-read offense. San Francisco put up 45 points in that game, led by Kaepernick’s all-time quarterback record of 181 rushing yards. In the Week 1 rematch earlier this season, the Packers felt ready after having spent a lot of time in the offseason preparing to stop that unique style of offense. Well, instead of repeating what they did so well against Green Bay eight months earlier, the 49ers took to the air, as Kaepernick lit up the Packers for 412 passing yards. "That’s the way this league is: you take one thing away, you’ve got to be able to play all phases," Capers said Friday. "We’ve got to find that right combination to where we play both the run and the pass." 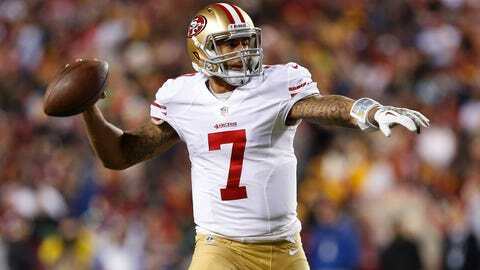 Kaepernick was fourth among quarterbacks this season in rushing with 524 yards. He was also tied for third among QBs in rushing touchdowns with four. However, Kaepernick didn’t have a single game throughout the entire 2013 regular season that was even half the rushing production he had against the Packers in last year’s playoffs. His season-high was 87 rushing yards in Week 2. As a passer this season, Kaepernick was very average — if not a bit below average — in comparison to the rest of the league’s quarterbacks. On the positive side for Kaepernick, he was 10th in passer rating and only Kansas City’s Alex Smith attempted more passes while throwing fewer interceptions. But, Kaepernick was ranked No. 20 in passing yards, No. 17 in passing touchdowns and No. 31 in completion percentage. Also, somewhat surprisingly for such an elusive quarterback playing behind a very good offensive line, Kaepernick was sacked 39 times (11th-most in the NFL) this season. The Packers weren’t good against the pass this season, finishing 24th in passing yards allowed and 26th in interceptions. Green Bay was eighth in sacks, but the Packers sacked Kaepernick only a combined three teams in the previous two matchups. Back in Week 1, the Packers’ run defense looked so promising. They held Gore to 44 yards on 21 carries and racked up six tackles-for-loss in the process. That began a string of positive performances from Green Bay in stopping the run. By Week 7, the Packers were third in the NFL against the run and were on pace to be the best in franchise history. But, by the fourth quarter of the season, all of those feel-good moments were long gone, finishing the year as the NFL’s No. 25 run defense. "I don’t have any secret answer for you or any special potion," linebacker A.J. Hawk said. "But we’re working on it. We’re making sure everyone has everything right, and we’re all playing together, basically." Without Clay Matthews — who played extremely well against the run in Week 1 — and Johnny Jolly in this game, it will make the challenge of stopping Gore far more difficult. "Those guys are unreplaceable-type guys," Hawk said of Matthews and Jolly. "Not only what they bring physically and mentally, but their passion and energy, too. That’s kind of the story of our season, the last couple seasons, is guys stepping in and playing well that you might not have normally seen." That list of players who wouldn’t otherwise have been seen is headlined by undrafted rookie outside linebacker Andy Mulumba, who picked up his first career sack in Week 17 and was awarded a defensive game ball. At age 30, Gore just completed his third consecutive season in which he was healthy for every game, finishing with yet another 1,000-plus yard year. "In my opinion, he’s one of the most underrated backs in the league, it seems," nose tackle B.J. Raji said. "The media never really talks about him, but if you look on film, his instincts, he’s squeezing through gaps that are a few inches wide. It’s amazing to watch." Days after being cleared to play, Rodgers took the field in Chicago with the NFC North title on the line. While he wasn’t as sharp as usual early on, the combination of a 55-day absence and battling back from a fractured left collarbone will do that to a quarterback. But, on the offense’s final play, Rodgers escaped pressure (with help from the "unsung hero" John Kuhn) and fired a deep pass to Randall Cobb for the game-winning score. "To play through that, mentally what he’s been through the last three weeks, my goodness; I think this is probably his finest hour as a Green Bay Packer," coach Mike McCarthy said of Rodgers. Rodgers will face a much stiffer challenge this week from the 49ers, a team that finished seventh in the NFL in passing yards allowed. NaVorro Bowman was arguably the best inside linebacker in football this year, and not far behind him is fellow inside linebacker Patrick Willis. In fact, ProFootballFocus ranked Bowman and Willis as No. 1 and No. 2 at inside linebacker in the NFL this season. Rodgers will be tested, and, as is often the case for the Packers when he’s under center, his performance will likely be a significant factor in whether Green Bay’s season continues or whether the team is cleaning out its locker the next day. It wasn’t a great start to Lacy’s rookie season: 14 carries, 41 yards and a fumble. With the exception of one positive drive for Lacy that concluded with him scoring his first career touchdown, the 49ers bottled him up. By year’s end, Lacy was a second-team All-Pro selection and a front-runner to be named offensive rookie of the year. "He’s a totally different back; it’s night and day," receiver James Jones said of Lacy. "He’s a totally different back — way more comfortable, way more confident. They’ll have to account for him. I know by them watching film and seeing what he’s done during the season, they know he’s not the same player he was Week 1. It’s good for us to have him in the position he is now." Lacy became the first Packers running back since Ryan Grant in 2009 to finish with more than 1,000 rushing yards. He accomplished that even after missing nearly two full games with a concussion that came on an illegal hit by Washington safety Brandon Meriweather. What hasn’t changed since Week 1 is how good San Francisco is against the run, finishing the season ranked No. 4 in run defense. 5. Ice Bowl: the sequel? The talk all week has been about the weather, and for good reason. With temperatures projected to be well below-zero, including a low of minus-19 by the time the sun sets in the second half, the weather will absolutely play a role in the outcome of this game. To the Packers’ benefit is that they live in this climate during the season and have been experiencing a cold Wisconsin winter for more than one month already. To attempt to get his team ready for it, 49ers coach Jim Harbaugh brought his players into Wisconsin a day earlier than usual. Having a walk-through practice and just seeing how it will feel to throw, catch and kick in harsh temperatures seems like a smart plan from San Francisco. But even for Green Bay’s players, this will be the coldest game they’ve ever played in, too. "Played in a few cold ones but nothing like this, so it’s going to be a challenge," left guard Josh Sitton said. "We have the advantage of getting to practice in it, so you kind of get used to it. I think once you get to a certain temperature it’s tough for anybody to get used to it." One question that the Packers have been asked frequently this week is how they plan to combat the temperature, including the possibility of wearing sleeves. Lacy and defensive lineman Mike Daniels were among those who said they had no interest in wearing sleeves. "I just feel like if I had sleeves, I might fumble or something like that," Lacy said. "I’m just staying with no sleeves. I’m comfortable that way." One thing is for sure: this is going to be one of the coldest games in Green Bay Packers history.